Pen and black ink and brown wash on laid paper, heightened with opaque white, within a drawn frame. Partial promised gift of the Baymeath Art Trust and partial purchase on the Herzog Fund. Possibly Pieter Barbiers the Elder (1717-1780), Amsterdam; possibly his sale, Van der Schley . . . IJver, Amsterdam, January 16, 1781, Album B, lot 67: "Een Kruisiging Christi, met de Pen en gewassen door Lange Pier" (to "Oets" for 0.6.0 fl. ); unidentified collector (his armorial stamp in red on verso; not in Lugt); Ingeborg Tremmel (1925-2002), Germany; Tremmel Collection sale, Munich, Ketterer Kunst, 5 May, 2003, lot 243; sale, London, Sotheby's, 4 July 2007, lot 9. 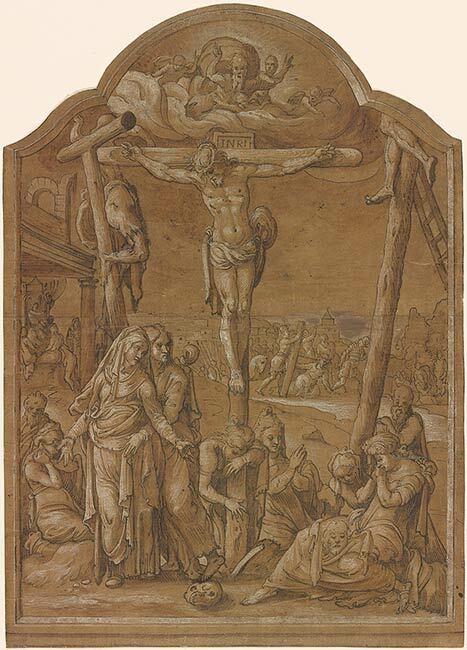 The Crucifixion by Pieter Aertsen is a rare drawing - fewer than two dozen drawings by Aertsen are extant - by one of the most important artists working in the Netherlands in the middle of the sixteenth century. While perhaps best known today for his innovative genre scenes, Aertsen's religious works for churches in Antwerp and Amsterdam established his reputation. This drawing appears to be a complete study for such an altarpiece (unknown today). Aertsen enlivens a conventional Crucifixion scene with bold and distinctive details fully in keeping with his sensitive and imaginative approach. Expressive gestures and refined figures present a sense of palpable sorrow and anguish mingled with divine grace.